The SIG SAUER P220 Paddle Holster, ideal for military or Close Protection personnel. 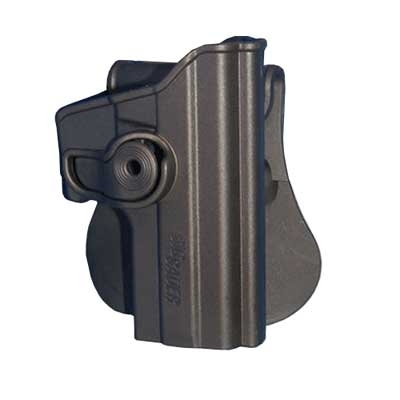 Manufactured by SIG SAUER, the P220 Paddle Holster is made from tough and durable polymer, the paddle contoured for a better fit. With a single point of retention, the SIG SAUER P220 pistol can be drawn from the holster in one slick movement, with the trigger finger releasing the retention at the side of the holster. As with other retention holsters, such as the Blackhawk SERPA Holster, SIG SAUER have used retention of the trigger guard for extra security. The SIG SAUER P220 Paddle Holster is 360 degree adjustable to enable positioning for different draw styles and positions such as cross draw or covert small of the back. With the addition of the SIG SAUER Molle adapter, the SIG SAUER P220 Holster will attach to tactical vests and other molle type tactical wear. Sits where your trigger finger normally slides at "The Ready"
This holster fits P220 "Full Size" rail and P220 match models only. Does not fit non-railed full size, Combat, Carry, Compact or Sport models.